I was so exhausted from White Party at Vizcaya on Saturday night that I slept almost all day and only stopped by the Muscle Beach Party for a few minutes. 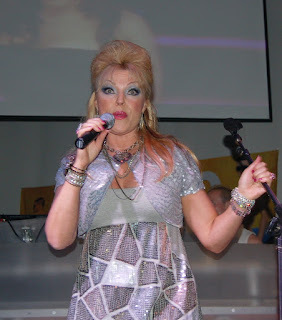 I did go to Noche Blanco to see Kristine W. She was awesome as usual. Tonight the Art Madness for Art Basel Miami Beach begins and I'm already working out my schedule for the week and I have several events each night including three for tonight. I just hope I can get all my work done. Check out my Art Basel cover stories in Where Miami Magazine (in all the hotels now) and in Wire Magazine (out Wednesday). Happy Art Basel. 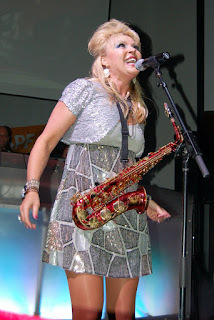 Photos: Kristine W. at Noche Blano.